"Church Buildings - Second Baptist Church"
(Top Photo) Rev. 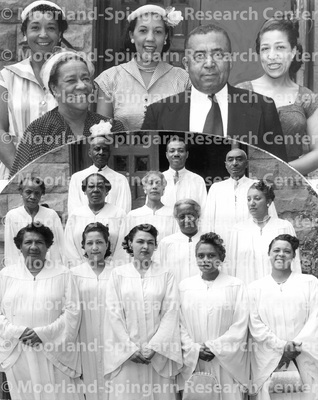 John L. S. Holloman, Sr. and Mrs. Rosa V. Holloman with three of their four daughters: Carolyn Holloman Troupe, Jessie Holloman Jackson, and Grace Holloman Davis in front of Second Baptist Church of Washington - 816 3rd Street, NW. (Bottom Photo) Second Baptist Church Choir.